It is often stated by photographers from the past and those living that they often visit the same areas to take photographs. They revisit a site to capture the scene at different times (i.e., sunrise, sunset or midday) or different seasons to capture the effects on the landscape. When I started taking photos, I thought it was sufficient to visit an area once, take various pictures, and move on to the next location. The WWII memorial is a perfect example of my desire to improve my images. Approximately a month after I bought my camera, I traveled to the WWII memorial on Memorial day and took various photos. I had no idea how to properly compose an image. I just started snapping. These initial results are reflective of my inexperience. As I reflect, I realize that was a very bad time. I competed with other tourist and photographers to take pictures. It was in the middle of the day where the light was harsh. Therefore, the pictures were not too pleasing. After some time, I traveled back to the Memorial and took some photos. This time, I paid attention to composition and I made certain my images were relatively free of bystanders. However, there was an additional component missing. I did not realize this until some time later. My images had improved. However, I took them late in the evening. Therefore, the sky was black. 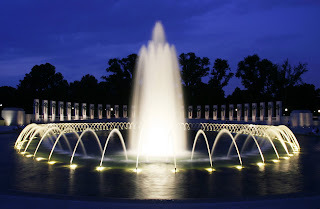 There was no color to complement the water and structures at the memorial. This leads me to my most recent excursion. I went back to the memorial to capture them during twilight. This is the time where the sky is blue. The images I’m showing contrast with the ones on my website. The blue sky provides one more element. This additional piece adds interest to my images and illustrates there is always room for improvement.